"Let me go over to that puzzle on the table and see if I can contribute to its completion." As I walked into the souvenir store outside of the Grand Canyon, I saw one of those landscape puzzles with a thousand or so pieces scattered on the table. The easiest part, that is the edges, was completed and some of the other parts had been worked on. Apparently, people who came into the store probably sat down to work on the puzzle like what I did. Since the puzzle was in a store I don't think it was meant for any one person to complete it. My thought when I first saw the puzzle was, "I want to be part of the completion process and do my part." Many times I see God's plan for salvation and redemption in the same way. We are all given pieces of a puzzle to work on and one day all those pieces will come together to complete God's plan. Like the puzzle, it takes many hands and time spent to bring the puzzle together. 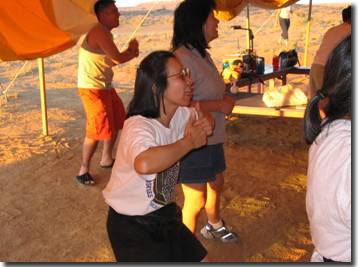 This summer "the piece of the puzzle" that God gave me was being in Arizona with the Navajo Native Americans. I was part of a tutorial team to help the kids with their academics. Being a teacher I wanted to use my skills in a tangible way. Ironically the strength/skill that I came with was not what God used. I would joke with my teammates that I had an average of five kids each day, but they were five different kids! It was difficult to teach to the children's area of need because I did not know which kids would show up for tutoring that day. So, it was not my fabulous teaching skills that God used but I guess it was my availability. I was able to meet with one of the Navajo teenagers and have a one-on-one Bible study with him which was not my plan but God's plan. I also had some great conversations with some of the people where they shared about personal matters and now I can pray more specifically for them. God in His sovereignty knows how the pieces of His plan will come together. We can all contribute in God's plan of salvation and redemption. This summer I was in Arizona with Navajo Native Americans. I was part of a tutorial team to help the kids with their academics. Being a teacher, I wanted to use my skills in a tangible way. Ironically the strength/skill that I came with was not what God used. I would joke with my teammates that I had an average of five kids each day, but they were five different kids! It was difficult to teach to the children's area of need because I did not know which kids would show up for tutoring that day. So, it was not my fabulous teaching skills that God used but I guess it was my availability. I was able to meet with one of the Navajo teenagers and have a one-on-one Bible study with him which was not my plan but God's plan. I also had some great conversations with some of the people where they shared about personal matters and now I can pray more specifically for them. Ecclesiastes 11:5-6 says, "As you do not know the path of the wind, or how the body is formed in a mother's womb, so you cannot understand the work of God, the Maker of all things. Sow your seed in the morning, and at evening let not your hands be idle, for you do not know which will succeed, whether this or that, or whether both will do equally well." These verses remind me that we do not know the outcome, or even the working out, of what God does. We just need to faithfully and obediently trust Him by doing our part and know that God will do His part. God really blessed me this summer with the privilege of participating in the PaLM Arizona VBS 2005. Having never gone on any previous mission trips, I did not know what to expect but I knew that God was about to do amazing things. I was assigned to teach the 4th- 6th grade girls, a task that took me off guard as I was expecting to be a co-teacher. Anxious and unsure of my assignment one thing Pastor Howard emphasized to the team was to be "flexible," and I really took that phrase to heart those 10 days. The girls in my class were so encouraging and although many of them were not Christians, God was there during our lessons as the girls were really thinking and asking many in-depth questions about God and Satan. However, I really believed that I went to Arizona more as a student than a teacher. Granted I was to teach about God and the bible to these girls, but at the same time God really opened my eyes to the needs of the Navajo community and it was really humbling to learn about their difficult lifestyles and how little they had. One thing that struck me the most was their love and openness for our team. Even though we were strangers and many of the members on my team were there for the first time, you could see the joy in the children's faces that we had finally arrived and were going to play and spend time with them. God also blessed me with an amazing team this summer consisting of 23 members from various churches and age groups but from day one we all clicked very well. It was so incredible to have that sense of unity and all working for the same purpose of serving God and showing His love to the Navajos. Even more, everyone was so willing to serve not only the Navajos and God but each other as well. There are so many stories I could share about how God showed Himself to our team this summer, but I think the most important thing is to acknowledge that none of it was possible if it were not for God. I wholeheartedly believe that He was watching over and guiding our team the entire time. He has started a good work in Arizona and I trust He will not stop until it is finished. On the last day of our trip a member of our team challenged us to remember that this is not the "end" but only the "beginning." We can continue to build relationships and show love to these people through letters but also through prayers. May I remember that and keep it close to my heart always. Praise God! Several years ago, I received a frog key chain from a friend and she told me that when I looked at the key chain to remember that FROG stood for Fully Rely On God. She challenged me to put that phrase into practice, but I clung to my stubborn ways thinking that I still had control over my life and that I could figure things out on my own. God knew that I would need some helping learning how to rely on him, so he put in my heart the urge to serve him on a short term mission trip. As I prayed about where God was leading me, I learned about PaLM and their trip to Little Blackspot Mountain, AZ. After I had been accepted as a team member for the trip, little self-doubts crept into my head. What if I didn't get along with everyone? What if I couldn't relate to the Navajo kids? What if the teen girls (who I was co-teaching) just didn't want to talk to me at all? And most of all, was I ready to allow God to work through me and mold me into his willing servant? It was really clear that I had no control over any part of this trip. I had never gone on a mission trip before, no teaching background (not even Sunday School), and no prior contact with any of the Navajos. God reminded me in Philippians 4:4-6 that he would grant me peace if I just prayed and trusted in him. He told me that he had already prepared my heart months in advance to be ready to serve him. He had prepared for me an awesome co-teacher who made the lesson and crafts go so smoothly. And most of all, he had given me a loving Christian team that worked well together and were there for the purpose of ministering to the Navajo community. All I had to do was listen, trust, and obey. And my time in AZ was filled with blessing after blessing. I got to meet a whole different culture of God's people who loved being there with us. I saw God working through each team member and giving each of us patience with the kids and the energy and passion to just be with them. I watched as kids gave hugs out freely and were excited to be there for the VBS to learn more about Jesus. And my greatest source of joy, I finally saw my teen girls open up and treat us more like their friends than just strangers. On the day we left, I felt a sense of sadness overcome me because I had really grown to love the kids and team members and knew that I would miss my time in AZ. But my heart had listened to God and learned so much from this experience. Even now when I'm standing in front of my door fumbling in my purse to find my keys that phrase pops into my head each time I see that frog. And finally, through Arizona, that's exactly what I learned- to fully rely on God. To go out to Arizona for my eleventh summer for a new program was truly a blessing. 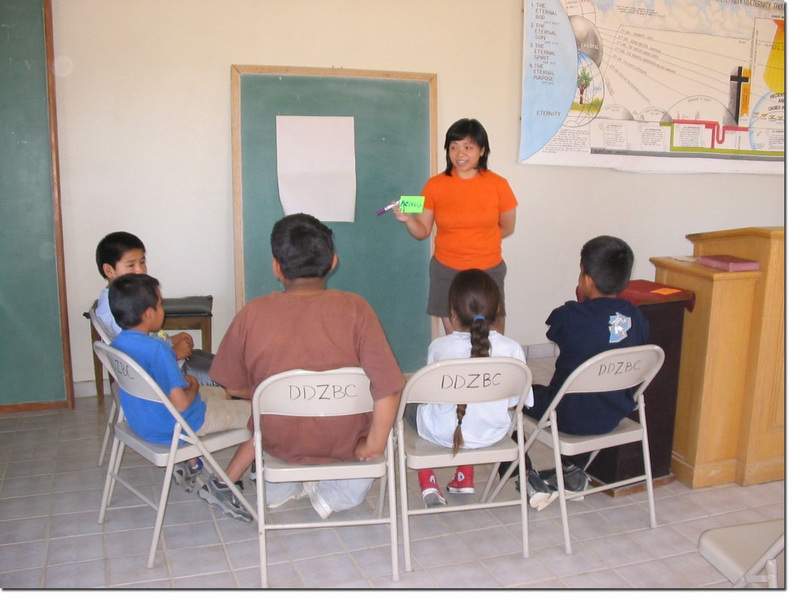 The tutorial program was an academic program in which a team of us went out to Little Black Spot Mountain on the Navajo Reservation for three weeks to teach the Navajo kids about reading, writing, and math. There were eight of us all together including our family. My primary role on the team was to help Grace Lin teach the third, fourth and fifth graders. Each day the program ran on a regular routine - just like school - and I think it was a great experience. Though it was very tiresome to work seven hours each day, I felt that the rewards (e.g. helping the kids learn, getting to know them better) more than made up for the fatigue I felt at the end of the day. The kids were wonderful, just as I knew they would be. I miss seeing their smiles and hearing them say the "darnedest things". Click pic to zoom Hair stylist at work The experiences with the team were amazing as well. Thanks to the small size of the team, I felt like we were all one big family. Now I know what it feels like to have an additional three older sisters, all of whom I grew close to throughout the three weeks. For the first ten days, we had the entire Big House (the cozy home we stayed in on the compound) to ourselves. When the VBS team came out, I didn't want to give it up. We had spread ourselves out and had so many inside jokes that the VBS team accused us of being a cult with its own language. The tutorial team connected easily and had some awesome experiences that I know that I'll always remember. God truly blessed me with this great opportunity to do His work in a significantly different but refreshing way. I thank Him for the terrific turnout and for bringing the Navajos and other sisters-in-Christ into my life. Josh began with 1 student but ended with 10! How awesome it is to see God working in the lives of others from the seeds you planted many years ago. This is what I have seen from the seven PaLM short-term missions trips that I've been on. By making a commitment to the Navajo people, I have truly seen God working in the lives of many of the Navajos and have personally learned much. Over the years I have seen many of the Navajos grow and mature in the Lord. I also see many of the same kids come to our VBS every year. Some of them I saw when they were too young to go to class and now they are in fourth and fifth grade. I felt challenged this year because I was asked to teach the high school and junior-high school boys. I had never taught kids older than third grade, so I did not know what to expect. Our first day of VBS was somewhat discouraging because my co-teacher and I only had one student. Although it seemed discouraging at first, I was reminded by the fact that this was all in God's plan. Having one student allowed us to talk to him one-on-one and we were able to get to know him better. I think that because both my partner and I were teenagers made our one student feel more at ease talking to us. As the week went on, I became more and more encouraged by the addition of more students. Then, on our last day of VBS, God blessed us with ten students, which made me so happy. All of them have been to our VBS in previous years and most had already accepted Christ. As a result of my experience on this past year's trip, I have learned not to be discouraged by anything, but to be content in all circumstances and use our situation to glorify God. Since this was my sixth year on this trip, I had very high expectations. I enjoyed each of the previous years because each year was very different from the others. This year was no exception. A big difference in this year's trip was the team. More than half of the team was made up of teenagers, which changed the dynamics of the group. Although the team for each year is different, it had never been a majority of young people. Through this, God showed me that it does not matter how old you are. All that matters is that you have a willing heart to serve God and that it is shown through your hard work. I did feel that this year's team worked well together. 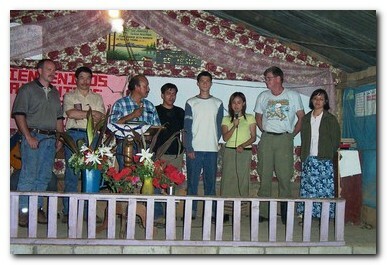 We were able to create new relationships as well as continue old ones as we fellowshipped and served together. Click pic to zoom Last day, ten students Over the past years, I have seen many times the sovereignty of God in our lives. There were times when we were caught in a heavy rainstorm and our vans got stuck in the mud. However, God was watching over us and we were able to get out safely. Another time, during a thunderstorm, I was sleeping near a window. For some reason, I decided to sleep with my feet towards the window, instead of my head (as was my habit). In the middle of the night, the window broke and glass fell in. Because of that incident, I felt reassured that God was definitely with us and that it had been him who told me to change my position. God's control over us during the trips reminds me of the control that He has over my life. A major part of our AZ missions trip is constant prayer. Praying about almost anything at almost any time is a really powerful experience. Through our times of prayer together I could truly feel God's presence in Arizona. Whether it was prayer with other team members or during my own quiet times, God revealed Himself to me and deepened my understanding of Him as I continue to grow in Him. I learned all these lessons over the past six trips. However they were also confirmed through this year's trip. I thank God for blessing me with a great team who worked hard to serve the Him. I was encouraged by the team's love for doing God's work and their love for God. This has really impacted me to want to continue to minister to the Navajo people in the coming years. Palm getting into the song! We have a wonderful Lord! As you know, I participated in PaLM's mission trip to Arizona this summer. I want to share a few thoughts about what I learned from the Lord. First, it was a privilege to serve on this trip. 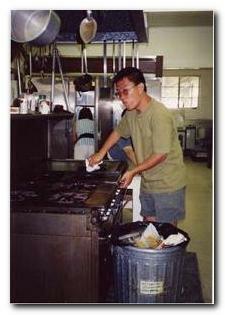 One of my responsibilities was to team teach (with Henry Moy and Vivien Ngai) an adult class. Although I have been teaching high school for many years, I had some anxious feelings of inadequacy teaching the Bible to adults. I have always believed that teaching from the Bible was special. I was very concerned about not having enough to share. Also, I didn't know the students I was to teach and they were from another culture. The Lord provided support and answered my prayers. We worked together as a team. I was able to try out my lessons with the team for feedback. We met daily for feedback and prayer. We bounced our teaching ideas off of each other and prayed for one another and for our class. During the teaching sessions, the Lord even gave me the right words to speak and the students actually participated. After class, there was time for crafts. This was a time when we were able to just sit and listen to the ladies' concerns. I met Susie, who was a Christian. She shared her desire to have a consistent time and place to worship and learn more about the Lord. Through our sharing I discovered that their concerns were not very different from mine - concerns for their children, family and everyday struggles of life as well as their desires and dreams of education and a better future. We prayed together, giving these needs to the Lord. I learned that God's love transcends all barriers (culture, language or geography). Another blessing was the privilege of serving with the PaLM team itself. Nowhere else can you assemble 23 strangers together for 10 days with one goal (Eph. 4:11-13) and have them work together in such harmony. Well, it happened. We benefited greatly from PaLM's leadership (Howard, Yan, Fay) and experience. They planned and managed every aspect of this trip. This included the daily schedule with all the essentials of living, eating, shopping, traveling, cooking and cleaning, fellowship, sleeping and of course ministry. All these elements were well balanced with sensitive tough love and discipline. Alongside all the planning, we were able to see the Lord answer prayers and provide protection both physically and from satanic attack. We had a record number of flat tires and other car electrical problems! But the Lord covered us with His presence and some of the guys received lessons on changing flats. VBS attendance was initially low but we saw that with prayer the Lord increased the number coming. We ended up having one of the highest turnouts in the adult classes this year. Click pic to zoom Teaching the adult class This summer's Arizona team consisted of many teens (14 teens out of 23). I was a little concerned. However, to my surprise, I was really blessed by the teens. I saw how we worked together. 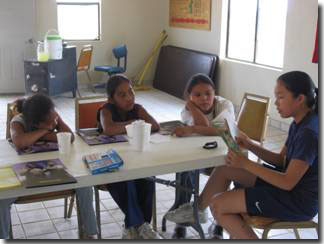 The teens encouraged one another and the Navajo kids. They used their youthful energy and stamina to play with the kids in the hot Arizona heat (>105 degrees). They cooked, cleaned and served one another. They worked and played, planned and prayed with each other and for the Navajos. It was such a blessing to have experienced this. The Lord taught me to not underestimate His power in and through the lives of our young people, who are on fire for Him. Finally, the Lord provided a glimpse of how really big His family is of those who belong to Him. Now I know many more specific family members (names and faces of brothers and sisters) and even though we are physically apart, we are all connected as one family in Christ. I continue to pray for each one. We keep in touch. I can see how the Lord is working in lives and they are a blessing to me. I went to Hardrock, Arizona in the summers of 1996, 1997, 2001 and 2002. That may seem like a lot of trips and time in Arizona. However, going to the Navajo Reservation for four years has only left me more in awe, more humbled and more desirous of knowing the people there and the God who created that amazing land and sky that one sees there. I truly feel that God has called me to serve Him in Arizona working with the Navajo people. It never gets old. Every year I learn something new and He never fails to teach me. The question everyone asks me after I tell them that I'm spending a fourth summer on the Navajo Reservation is "why do you return every year?" I answer their question with one of my own, "How can you not go back?" There is something about Arizona that simply captivates you. Maybe it's the smiles the Navajo kids give us, or it may be the beautiful sunrise, or the vastness of Grand Canyon or the amazing star lit skies. I don't know. I'm not sure. But one thing that I do know for sure is that God has placed a burden on my heart for the Navajo people. He has told PaLM to send a team every year and minister there. And I know that He is moving and working in Arizona for more than just the ten days that we spend there. He is always there with them, softening their hearts and preparing them for the next time we return to share His Word. Missions is an amazing experience. No matter where you go, God will not fail to reveal Himself to His servants. I can only wish for those around me to experience everything that I have in my time there. Once you go, you hunger to go again. Once you meet a Navajo kid, you want to take him/her home. And every life you touch there you want to see grow and mature in their faith. Once you go, you don't want to leave. What did you think of PaLM's short-term missions trip to the Navajo Reservation? It was my first missions trip and I enjoyed the opportunity to serve and learn from others. 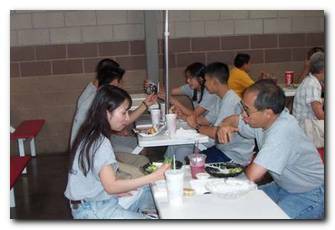 Click pic to zoom Henry and others enjoying their lunch while waiting for the shoppers to finish. Did you sense God's presence and that God is at work with the children and with the people there in Arizona? Certainly God was at work with the PaLM team protecting us and getting us through obstacles (plane delays, planning issues). Though not evident in the statistics collected at the end, God was there and working in the hearts of the children and adults. 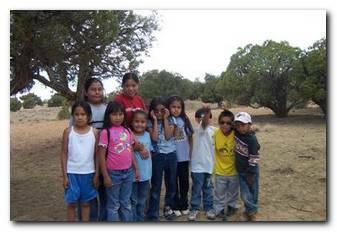 The love we extended to the Navajos was reciprocated by the smiles and openness of many of the children and adults. Did you sense that God has provided team unity despite of the fact that you and other team members come from different churches? Team unity was a strength at this ST missions trip. There are so many different personalities, age groups and background experiences that could have easily disrupted this trip. But the spirit of forbearance was definitely working. Do you have any reservation about going to Arizona again next year? It is a bit earlier for me to plan for next year but if everything works out, I would enjoy going again. Scott, along with Karen, waiting to board our plane. Before I got to AZ, I had expected that I would be going to serve God and to be used to serve others. That pretty much was the case but He blessed me even more by having a really awesome bunch of brothers and sisters to work with as well as a deeper understanding of why we do what we do for Jesus. 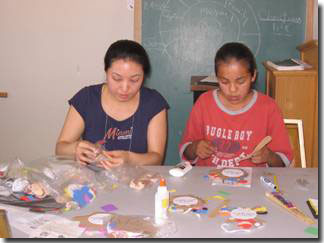 When I started working with the Navajo, there wasn't a problem seeing the needs of the children. They are the same needs that any child has, namely, to be loved, to know that they are significant to people, to find a direction in their life, and above all, to know the Lord Jesus Christ who can provide all these things perfectly. But the question was how to meet these needs. You know how sometimes you see people who have great needs and you can't figure out how to help them? Click pic to zoom Scott and Karen waiting to board the flight to Arizona That was the dilemma I faced. Fortunately, God provided some of the best people I've ever worked with. When I was serving with my teammates, their love and commitment fairly radiated from them. As part of that team, the service to the kids no longer became a question of "How do I?" or "When should I?" but rather a natural extension of our activities there. Maybe a better phrase that summarized my time on the Navajo Reservation would be "living love". Through this experience, I've been made more aware of the need to work together in pursuing God's Will. Since I've been back at my church, I've been teaching (in Sunday school and the College/Career group) more with the emphasis towards building up one's personal relationship with Christ and the body and having our service flow from that instead of just identifying needs and meeting them on our own strength. One of the biggest challenges that the Lord impressed upon me as a result of this trip is the need to pray and understand that prayer isn't simply a short conversation we have with God after which we then go back to whatever we were doing. It is instead, an ongoing interaction with Him that continues throughout the day. What I have come to realize from my trip to AZ is that it is just beginning of what God has in store for me and my church. On this trip the PaLM group will team up with a group of Guatemalan Christians and work with both Hope Bible Mission and Agape missionaries to do a puppet ministry in the remote Guatemalan mountain village of Chel and its surrounding communities. This trip does not require you to speak Spanish, although it will be very helpful if you do. And if you don't speak any Spanish at all, you will be taught some basic Spanish phrases to help you "get by" on the trip. Your primary mission will be to manipulate puppets in a children's program while a Spanish tape is playing. Don't worry, we'll teach you how to "work" the puppets and you'll get plenty of time, help, and practice to sync your puppet movements with what is playing on the tape. You will also be asked to give your testimony in English at various events. And each time you do so, a translator will convey to the people what you just said. In addition, the team will be expected to present some special music in both English and Spanish (again, we'll teach you). It is preferred but not necessary for every team member to be able to sing. Click pic to zoom Working in the river, washing the corn On this trip you will fly into Guatemala City where you will stay a few days. While there, you will learn some Spanish, practice with the puppets, finalize your testimony and practice your special musical numbers. The team will then be taken to the airport where you are weighted for the flight out (don't worry, they won't tell the world your real weight). It is necessary to weigh you because it is imperative that the plane is balanced in its weight distribution. From here the team is flown out in a small plane to La Perla where a small grass airstrip is located on a slope on the side of a mountain. Most people find the flight to La Perla exciting but those who are claustrophobic or aerophoic may disagree. During the remainder of your time there you will have many opportunities to do what you have trained to do. You will also have lots of opportunities to interact with the local folk. How involved you get in the lives of the people there is directly proportionate to your desire to be used by God and your willingness to seek new and creative ways to communicate with the locals despite the language barrier. I still distinctly remember the night when I first learned that the trip to Spain had been canceled. I don''t think any number of words can fully describe how I felt-the shock, disbelief, disappointment, and a wary feeling towards the idea of going on the "alternate trip" to Guatemala. Pastor Howard''s words weren't exactly what I would call comforting, but they were dead on: "Throughout our short-term mission orientation we emphasized, repeated and reminded you that it was critical that in preparation for your trip that you incorporate into your lives, your attitude...one trait, one characteristic...that of being flexible. You are about to learn first hand why we emphasized flexibility so much." I was very much comfortable with Spain. Rick had given us a detailed account of Camp Berea, what we were going to do there, what to expect, what to bring-it all seemed feasible. And, having taken Spanish for six years in school, I had continually been exposed to anything and everything about the country''s history, the geography, the people, and their customs. I was at ease with it all, and maybe that''s why God took that opportunity to teach me what I've always wanted-to be more dependent on Him. Suddenly, I was like a fish out of water. Things got confusing, and at that point, the details of Antigua were so scant that logic failed me. I realized then that there was only one thing I could do, and that was to pray, and pray hard. Only after I entrusted my future into God''s hands was I confident that my decision regarding Antigua, whether it be a yes or a no, would be the right one. (Since my decision was obviously a yes =)), let me first start off by saying that there is nothing ordinary about Guatemala. Whether it be the appalling amount of fumes that was emitted from the buses or the gorgeous mountains and volcanoes that hugged the horizon, the country did a pretty good job of keeping the team surprised. First impressions…the Students International house, a converted convent where we stayed, was absolutely beautiful. Antigua itself was pretty attractive-cobblestone streets, quaint and colorful stores, those Internet cafes that we were forbidden from entering… =) I had not known what to expect, but paradoxically, Antigua and S.I. had exceeded my expectations. In the States, whenever people had asked me what I was going to do in Guatemala, my answer had always been the same-"I''m going to teach kids English." It was the one piece of information that I was sure of. So you can see how flexibility came in when my site leader informed me that I would be teaching elementary school girls science, mathematics, and language arts…in Spanish. And you can see how it played a small role when they told me that I would need to wear a skirt every day. I had only brought one, and that was for church. Initial doubts did set in-is my Spanish good enough? What am I going to wear?! But, silly me, God already had everything worked out. So, what have I come away with from all this? I see God''s hand wherever I go, and His work is beautiful. A smile from one of the girls, the song of a joyful bird, the wrinkles on an old man''s face. More than anything, being in a land where there is so little, yet there is SO much, has taught me to appreciate the things that I have. Not the TV, or the computer, although I must admit I miss those. (Hey-at least I didn't drool like Hesed did every time I passed an Internet cafe!) I've learned to appreciate God''s blessings, his faithfulness, his creation, and the hope and the joy that he showers upon his people. I've come to cherish a more simple life, where busy schedules do not detract from God''s awesomeness. I've come to love Guatemala. (8/1/01) Llevaré tu gloria a las naciones, Señor! This year I was very blessed to have my entire family join the Arizona team. We haven''t gone as a family since before Allegra, our youngest, was born, although I have taken the boys back to Arizona a few times. We had a great time serving others and encouraging our boys to serve. I can think of a few times in the past when their presence has been a blessing to the team, if only for comic relief! Yet they are learning about the importance of missions and how to make it a priority in their lives. We as a family have been enormously blessed by the Arizona trip. Through the trip we've gotten to know Grandma Mattie, Wally, Beulah and missionaries John and Caye Courtney. We've learned how the Navajos live, their joys are a source of praise, and their tragedies drive us to pray. I thank God for the opportunities He''s given us to participate in His work among the Navajos. As the little AGAPE plane touched down on the grassy runway, it looked like all the children of San Luis came to welcome us. When we hopped out of the plane, the girls hung back smiling shyly, while the boys jumped right up to us and helped us unload our bags. They chattered brightly in Spanish as we walked to the village. The best part of this trip was watching kids help Angel, a team member, gingerly step on rocks half-buried in mud and muck. The kids happily tramped through the stuff while helping her keep her balance. It was moments like that which made this trip so memorable. The church in San Luis welcomed us as partners. It was a great privilege to worship with them and serve with them.